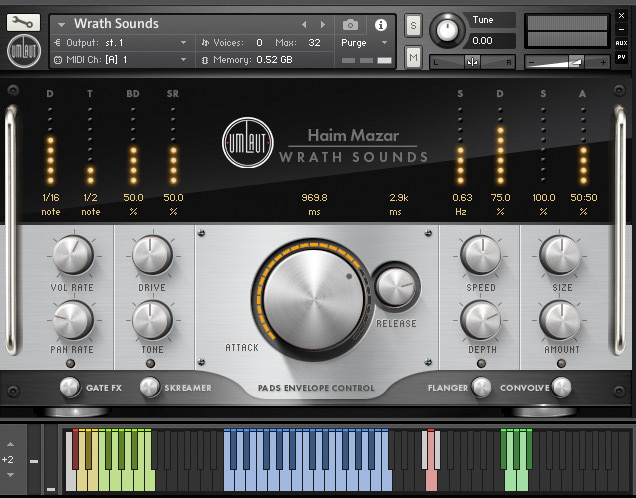 Haim wanted a basic Kontakt instrument to playback Sounds. He had a specific project where he needed pad sounds, rhythmic loops and pulses in a certain sound style and have all those implemented in our UA standard script. He wanted to choose all styles via drop down menu. We categorized the standard shell into three different categories of sounds: Pads, Rhythmic Loops, and Pulses which could be chosen from a drop down menu. Haim had a specific experience in mind for his loop choosing. He wanted say, have C2 play the entire loop - C3 and the following white notes would play the stems. While all instrument FX could stay as they were, he wanted the two central knobs normally routed to the gate and pan effects to be used for Attack and Release. This changed the order of the effects to Skreamer, Gate/Pan, Flanger, Convolve. Interested in creating your own Custom Instrument? Looking for a readymade solution ?